20-24 July 2008, pp. 1-6. Yazdani, A., Crow, M.L., “An Improved Nonlinear STATCOM Control for Electric Arc Furnace Voltage Flicker Mitigation” IEEE Trans. on Power Delivery, Jun. 2009. Yazdani, A., Sepahvand H., Crow, M.L. and Ferdowsi M. “Fault Detection and Mitigation in Multilevel Converter STATCOMs”, IEEE Transactions on Industrial Electronics, Jun 2010. Teleke, S., Yazdani, A.; Gudimetla, B. ; Enslin, J. ; Castaneda, J, “Application of STATCOM for Power Quality Improvement” Power System Conference and Exposition, PSCE 2011. A. Yazdani, etal, “Wind Generation, the Study and Analysis of Dynamic Behavior Impacts on Transmission System”, QT eNews, 2012. Atousa Yazdani, etal, “Control and Monitoring Requirements for Distribution Systems with High Penetration of Renewable Energy Sources” IEEE Smart Grid Innovation conference 2012. Atousa Yazdani, Yi Hu, A. Johnson (SCE), D. Martinez (SCE), “Development of Smart Grid Ideas –What needs enhancement?”, Published on T&D show special edition 2012. A. M. Ranjbar, S. M. Marjanmehr, A.Yazdani and S. Mohammad Sadegh, "A Neural Network to Estimate the Operational Time of Over-Current Relays”, 12th International Power System Conference (PSC 1997), 3-5 November 1997, Tehran, IRAN. A. Yazdani, G. B. Gharehpetian, S. M. Kouhsari, "Using Optimal Power Flow Concept for PST Allocation and Regulation to Minimize Real Power Losses”, 16th International Power System Conference (PSC 2001), 22-24 October 2001, Tehran, IRAN. A. Yazdani, G. B. Gharehpetian, S. M. Kouhsari, "A New Approach for PST Adjustment and Allocation in Power Transmission Networks” IFAC Conference held on Korea Sep. 2003. Vaziri, M. ; Afzal, M. ; Zarghami, M. ; Yazdani, A. ; Vadhva, S. ; Tavatli, F., “Voltage Impacts of DG on Distribution Grid with Voltage Regulators and SVCs”, Green Technologies Conference, 2013 IEEE , Publication Year: 2013 , Page(s): 322 – 329. A. Yazdani, et.al, “WIND STORAGE ENHANCED TRANSMISSION RESEARCH AND DEVELOPMENT”, California Energy Commission and Southern California Edison and Quanta Technology. H. Kang, and A. Yazdani, Enhancement of Power System Stability with VSC-HVDC Transmission", NAPS 2016, Colorado. 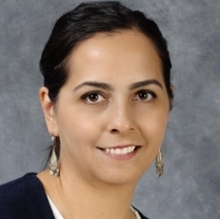 Dr. Atousa Yazdani, has many years of industry experience in design, modeling and analysis of power systems. Her main reseach interest is in the application of power electronic apparatus in power system, dynamic system analysis and testing of power system with the inclusion of novel technologies. She has received her PhD from Missouri University of Science and Technology in 2009. She has received her MSc and BSc in Tehran Polytechnics (2001) and Tehran University (1997), respectively. Dr. Yazdani has been involved with several consulting projects both in USA and abroad. She has been instrumental in several utility scaled projects such as integration of renewable energy, and implementation of stability algorithms utilizing synchrophasors data. She is an expert in power system modeling and analysis with the application of power electronic devices to enhance system stability. She has been instrumental in setting up the hardware in the loop laboratory test projects and device testing.